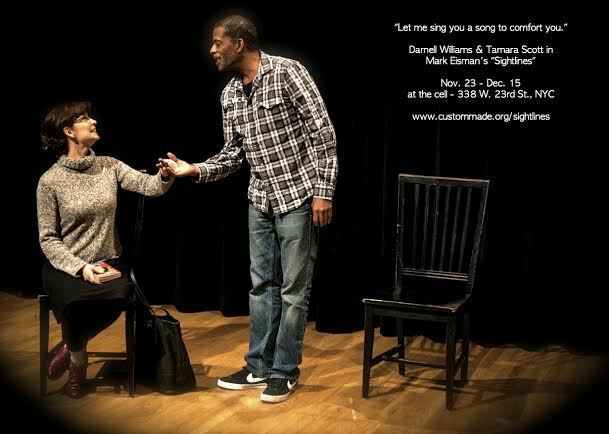 "Sightlines", by Emmy Award nominee Mark Eisman, is an intimate two-person play about finding connection in an ever-blurring world. Starring Daytime Emmy and NAACP Image Award winner Darnell Williams (All My Children's Jesse Hubbard) as Davis, and Tamara Scott as Ruth, "Sightlines" takes us on a journey with two strangers who come together in the oddest of places, grasping in the dark for a human connection that will guide them out of the "rabbit hole." Out of the darkness and into the light. Out of the light and into the darkness, they smash their way "through the looking-glass" into a Lewis Carroll world and a love story defying conventional perceptions. ask, "What is seeing? What does one choose to see?" Leading you in an out of the rabbit hole is an original score by ASCAP Fnd/Max Dreyfus Scholarship recipient Rona Siddiqui, fresh off her NYC solo concert debut and featured songwriter stint in Bill Finn¹s Cabaret at Barrington Stage and Lincoln Center's "Broadway's Future" concert series. On select Sundays, the Collective will offer portrait sessions ­ watch the process! Portraits, as well as the photographs making up the set, will be on sale throughout the run of the production. The play is directed by Custom Made's executive director, Leah S. Abrams.